I have many fond memories of my days at the University of Miami. Top amongst them was time with my Sigma Delta Tau (SDT) sorority sisters. Fast-forward nearly thirty years and I am now part of a group of SDT sisters who get together for lunch every couple of months. What I quickly learned from our new time together is that the bond of sorority sisters does, indeed, run deep. Bonds also run deep in the blogging world, which brings me to today’s exciting news. 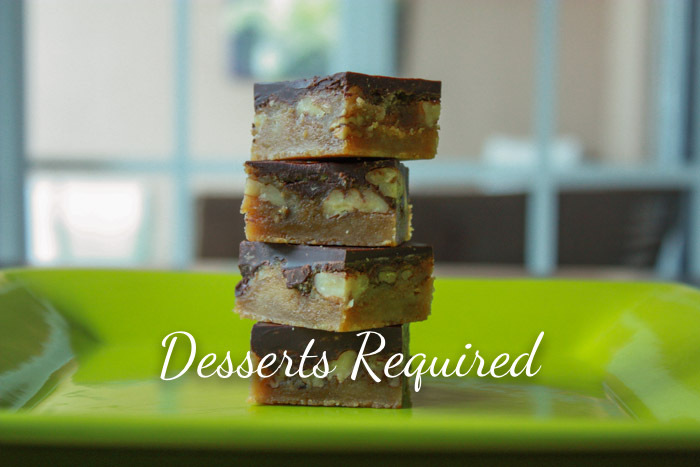 I am guest posting Butter Pecan Turtle Bars over at TAKE A BITE OUT OF BOCA, the wonderful blog of my friend Shaina Wizov. Head on over to TAKE A BITE OUT OF BOCA to read more, get the recipe, watch the video and grab the pin. While you are there, be sure to check out Shaina’s fabulous blog! Those look delicious. Heading over to your friend’s blog for the recipe now! Thanks so much. I know both Shaina and I appreciate it!! I love reading this. Your dad will be soooo happy!! yum! These are perfect for my sweet tooth. Thanks for letting me know. We sweet tooth people have to stick together!! Great guest post Betsy! This simple, delicious recipe will definitely be making it’s rounds with my family and friends (after a few Paleo modifications) and I know that they’ll be delighted to hear about where I found them! Thank you so much! I will be curious to hear what modifications you make!! Lovely guest post over at Shaina’s place. I love the 30+ year connection to this recipe, Betsy, the way you write about them and the passion for them in the video tells all. I’ll take the stack of four on the plate please! Thank you so much. I greatly appreciate your very kind words.